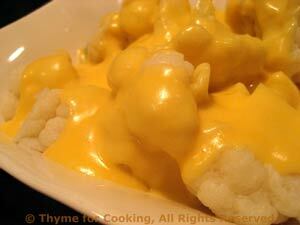 Cauliflower Cheese, classic British comfort food from Thyme for Cooking. As this is such a popular dish in England, I decided to use a proper Cheddar for it, Your favorite cheese will work, but maybe not for the bright gold color. The flour in the béchamel helps the cheese to melt into a velvety sauce without getting stringy. Cut cauliflower into pieces, put into a steamer basket in a saucepan with an inch of water. Put on medium heat and steam for 10 minutes or just until barely tender. In same pan, if not too large, or a small saucepan, melt butter. Add flour and cook, stirring with a whisk or fork (making a roux). Slowly add milk, stirring constantly until you have a thick sauce (Béchamel). Stir in cheese and heat until bubbly. Pour over cauliflower and serve. Note: Can be kept warm in a low oven (250F, 125C) for 10 - 15 minutes.